Derry City fell to a 2-1 defeat at the hands of Dublin side Bohemians in Friday's Premier Division match at the Brandywell. Former Linfield midfielder Philip Lowry fired City into an eighth minute lead - the first league goal the Bohs had conceded away from home this season. Kealan Dillon equalised on 25 minutes with a sensational volley which gave home keeper Gerard Doherty no chance. Marc Griffin scored the 76th-minute winner from Pat Kavanagh's cross. Derry pressed for an equaliser and almost scored when Mark Timlin's 30-yard free-kick struck the Bohs crossbar. In stoppage time Bohs keeper Dean Delany made a great save from Derry substitute Cillian Morrison's header. 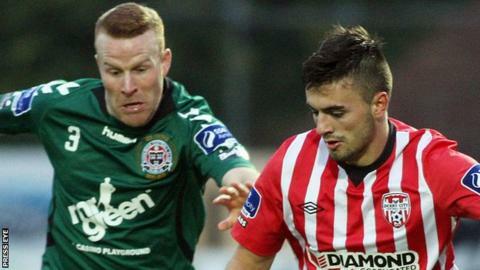 The defeat sees Derry fall one place to seventh in the league table with Bohemians moving up to third.